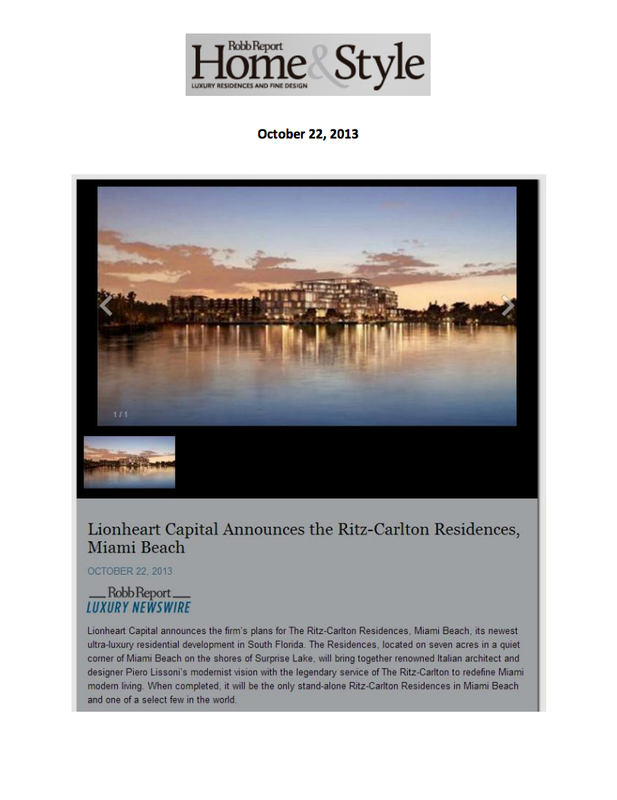 Lionheart Capital announces the firm’s plans for The Ritz-Carlton Residences, Miami Beach, its newest ultra-luxury residential development in South Florida. The Residences, located on seven acres in a quiet corner of Miami Beach on the shores of Surprise Lake, will bring together renowned Italian architect and designer Piero Lissoni’s modernist vision with the legendary service of The Ritz-Carlton to redefine Miami modern living. When completed, it will be the only stand-alone Ritz-Carlton Residences in Miami Beach and one of a select few in the world. The Residences are Piero Lissoni’s first architectural project in the U.S., and the project is being completed with award-winning Miami architecture firm ADD Inc. This expansive, amenity-rich and LEED-certified property will feature gardens, pools, entertainment spaces and a private marina for 111 condominium residences and 15 villas. The two- to four-bedroom homes range in size from 1,700 to over 10,000 square feet, in a selection of over 60 floor plans, with striking interiors also custom-designed by Lissoni. Homes will be equipped with Piero Lissoni designed, Boffi kitchens, oversized stone countertops, Gaggenau appliances and built-in coffee systems, along with equally impressive Boffi master bathrooms, complete with Dornbracht fixtures. Every residence will be wired for smart-home technology and many will include private elevator foyers, sprawling terraces, summer kitchens and plunge pools. In line with the long-standing tradition of excellence synonymous with The Ritz-Carlton name, these Miami Beach residences will include a collection of premier amenities unparalleled in greater Miami. Owners’ amenities will include a waterfront social room with a bar, catering kitchen and state-of-the-art entertainment system; tropically landscaped half-acre roof-top pool deck with stunning views of Miami Beach, Downtown Miami and Biscayne Bay; an expansive infinity-edge pool with a waterfall, spacious cabanas, whirlpool spa and poolside Grille Restaurant; a club room with bar, virtual golf and billiard table; a cinema-quality screening room; a game room and a kids room. Unique features of The Residences will be an on-site marina and a private luxury vessel for Intracoastal and beach access. Owners will have the opportunity to rejuvenate in a private spa treatment suite, steam rooms and a sauna, reenergize in yoga studios and work out in a state-of-the-art fitness center. There will also be a BBQ and dining area and a library/board room. In addition, The Residences will have two attended lobbies, valet parking, a dog grooming room and personalized concierge services. Perfectly located in a tranquil and charming residential community of Miami Beach where lake, ocean and waterway meet, The Residences will be the last project of this magnitude that can be built in this part of the city. Just a short distance to the area’s top-tier schools and steps away from the prestigious Upper North Bay Road, residents can enjoy the shops of Lincoln Road, the Art Deco District of South Beach and the central business district of Downtown Miami/Brickell and then return to the comfort of their homes in minutes. Set on the only lake in Miami Beach, the Developers’ vision for the existing structure was to strip it to its core elements, preserving its height and uninterrupted views. The result is 126 exquisite Residences surrounded by a neighborhood of upscale single-family homes on the shores of Surprise Lake. “The high-end Miami market has been anxiously awaiting a property of this caliber in this area for some time,” said Carolyn Ellert, Broker and Co-owner of Premier Sales Group, Inc., exclusive sales and marketing agent for the developers of The Residences. The Residences are priced from $2 million to $25 million for penthouses, and sales are slated to begin mid-November when the on-site sales office opens. Address: 4701 North Meridian Avenue; telephone: 305-953-9500; website:www.TheResidencesMiamiBeach.com. The principals of Lionheart Capital combined bring more than 50 years of experience to the acquisition, development, repositioning and marketing of real estate assets totaling over $3 billion in the United States, Brazil, China and the Caribbean. Recent ultra-luxury developments include The Ritz-Carlton Residences, Singer Island, Palm Beach and Le Sereno hotel in St. Barths. Lissoni Associati and By Lissoni offer a 360-degree approach unifying integrated planning, architectural and interior design, concept development, space programming, project management and creative services under a single umbrella. Their Brand Partner Portfolio includes Maserati, Michelin star-rated chef DavideOldani, and San Lorenzo Yachts. Headed by Italian architect and designer Piero Lissoni and his partner Nicoletta Canesi, Lissoni Associati and By Lissoni provide real estate developers in both the hospitality and residential sectors with complete lifestyle solutions from concept to implementation. Headquartered in Milan and New York, Piero Lissoni and his associates have won numerous awards for projects including the historic renovation and ground-up addition of the Mamilla Hotel in Jerusalem; the interior design of a 50-meter super yacht, Tribú, owned by Luciano Benetton: and the recent renovation of the Ferrari Club House at the Fiorano Race Track in Emilia-Romagna, Italy. In addition, Lissoni Associati has created hotels that have become city icons, from Amsterdam’s Conservatorium to Isantbul’s Bentley Design Hotel. Led by principals Laurie Ingber and Carolyn Ellert, Premier Sales Group excels at the sales and marketing of luxury condominiums. With over twenty-five years of industry experience, these real estate veterans have proven sales and marketing credentials, having negotiated and sold $3 billion in luxury residential transactions. Personally committed to each development, Premier orchestrates decisions ranging from floor plan layout and interior finish selections to sales center design and amenities programming, fulfilling the expectations of today’s upscale buyer. Premier’s sales team and professionals are dedicated to providing its buyers and customers with a memorable, personal experience of the highest caliber – the Premier experience. The Ritz-Carlton Residences, Miami Beach are not owned, developed or sold by The Ritz-Carlton Hotel Company, L.L.C. or its affiliates (“Ritz-Carlton”). 4701 North Meridian, L.L.C. uses The Ritz-Carlton marks under a license from Ritz-Carlton, which has not confirmed the accuracy of any of the statements or representations made herein. Premier Sales Group, Inc. a licensed real estate broker is the exclusive sales and marketing agent for Lionheart Capital.